HTD Canada's newest Centerstage model is True commercial, CSA Approved, sold and serviced in Canada at the lowest price guaranteed. Bring the movie theater experience to your home or business with this industrial grade popper manufactured by HTD Canada. 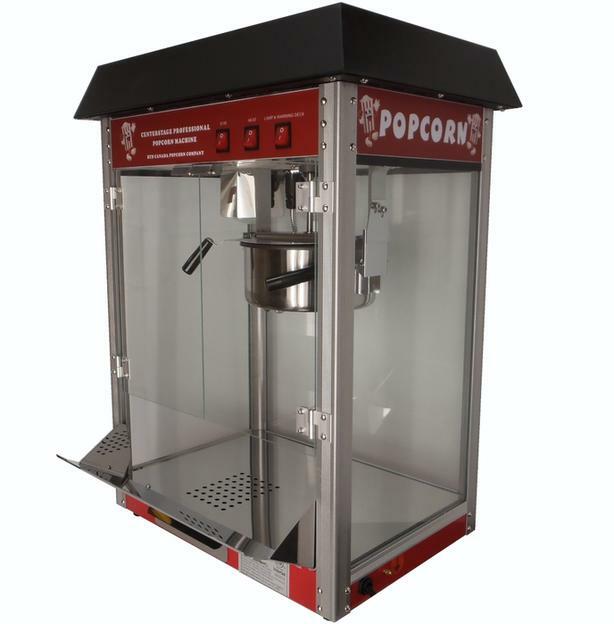 Our Centerstage Professional Popcorn Machines are one of the most powerful and technically advanced models presently available, an unbelievable 1364 WATTS . We have an ungraded amazing 300 Watt deck heater and a 50 watt warming / presentation bulb, these innovations will always guarantee fresh hot theater popcorn. This professional grade commercial popper has a stainless steel cabinet and deck insuring years of durability, a hard-coat anodized, high Thermal Mass Kettle for easy cleaning and dual thermostats for superior performance. This high production 8 ounce model will work on a standard 15 amp circuit so that it can be used anywhere without any additional electrical wiring. Our old-maid drawer will collect any un-popped kernels when stirring the popcorn, perforations in the bottom stainless deck allow the un-popped kernels to fall into the drawer leaving only fresh and fluffy popcorn in the holding bin. Our design also includes added features such as a direct drive pot stirrer therefor no more fussy cogs jambs and plastic fittings, air venting in the canopy /top to prevent overheating, thicker gauge metal, extra support in the frame and the superior Canopy / top design with under mount screws has a matte finish to avoid scratches and blemishes. The kettle is equipped with a magnetized lid which will move completely out of harms way, no more burns or difficulty put the ingredients into the pot and allow you to clean the components properly. Our Centerstage 8 oz popcorn machine is designed to produce approximately 160 small popcorn bags an hour.